This set of cling stickers allows you to see how you might look if you are ever unfortunate enough to be infected by a zombie bite. 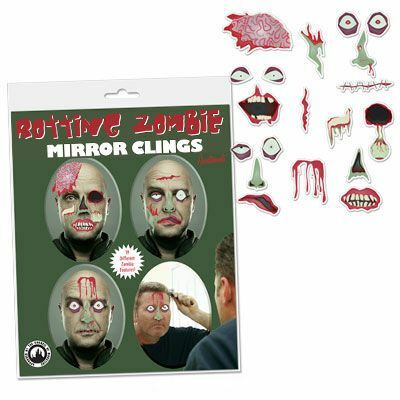 Just stick some of these non-permanent cling stickers to your mirror, then stand back, close one eye and gaze in horror at the hideous zombie staring back at you. One 7-1/2" x 9" (19 cm x 22.9 cm) sheet of nineteen zombie features in each package. Bagged with illustrated insert.